As consumers we’ve all grown quite used to the Amazon ‘standard’ of personalised recommendations. However e-commerce lends itself to personalisation quite naturally, and what happens on Amazon is smart, complex and, ultimately, expensive to create and maintain. What does personalisation mean outside of the retail sector, and how ready are most businesses to actually put it in place? Personalisation is often requested but rarely understood. More personalised customer experiences are often said to create more value for businesses, but often there is a huge gap between the business appetite for personalisation and the actual ability to do it properly. “We’ll get the personalisation to take care of that stuff” (arms simultaneously waving at the screen). This comment and others like it are common. Who wouldn’t want something that helps you be more relevant to a customer? But there’s a disconnect between the experience we have as consumers on the more sophisticated e-commerce sites and what is possible, or valuable, as a business in other sectors. Personalisation is complex - people, processes and technology need to be properly considered and then aligned. This doesn’t mean I’m against personalisation or think it isn’t useful. I’m not, and it can be, but we just need to have a clear idea of what we mean and what benefits we expect. So, what are we actually talking about? 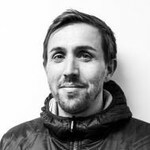 In trying to make sense of personalisation over the last few years (as both client side, web team manager and latterly as a UX Designer), I needed to have some clarity so I knew what we were and weren’t talking about. “Serving tailored content based upon a model of behaviour, needs or preferences”. Anonymous personalisation elements are those derived when users are not identified as being a specific individual by your website. User behaviour (for example the websites they visited before yours or the content they are interacting with on your website) and session-related information such as the user’s location, the device through which they’re accessing your website and the search phrases they used to find your content, all help personalise the online experience you offer to them. Known personalisation elements stem from matching the user to an actual individual e.g. existing in your customer database. Then, your website knows it’s them and only them. The user’s website experience is personalised on the basis of having a customer record of them that for example includes personal information such as age, family status, job title and income, their previous purchases or content downloads, their preferences and interests. This is then used in conjunction with behavioural data such as the user’s current location, device etc. to further personalise the experience. Some of the above mentioned information is provided by the user, for instance when they create and customise their profile on your website and set their preferences, and as such the user consciously expects to see content tailored to those settings. Other types of data (such as purchase history) are not consciously provided by the user to refine the information they see/receive: the user is served with personalised content without specifically expecting to see it. Digital maturity is a useful concept for framing what personalisation means from the perspective of a business. To put this into a practical context, let’s have a look at how personalisation providers approach it - they can be good at providing a wider context (beyond the tactics and technology). DBi, a partner of Adobe AEM, puts into the context of time where particular personalisation tactics can fall. 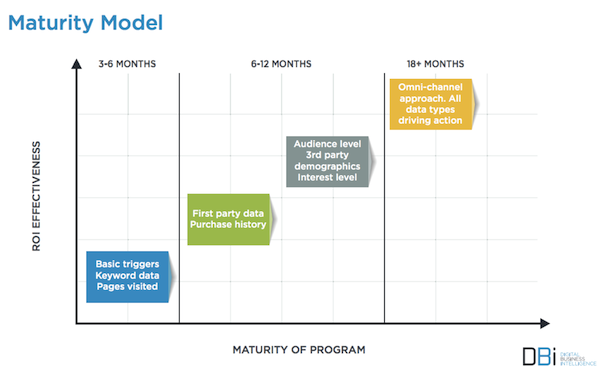 This is useful because it shows personalisation tactics aligned to digital maturity. 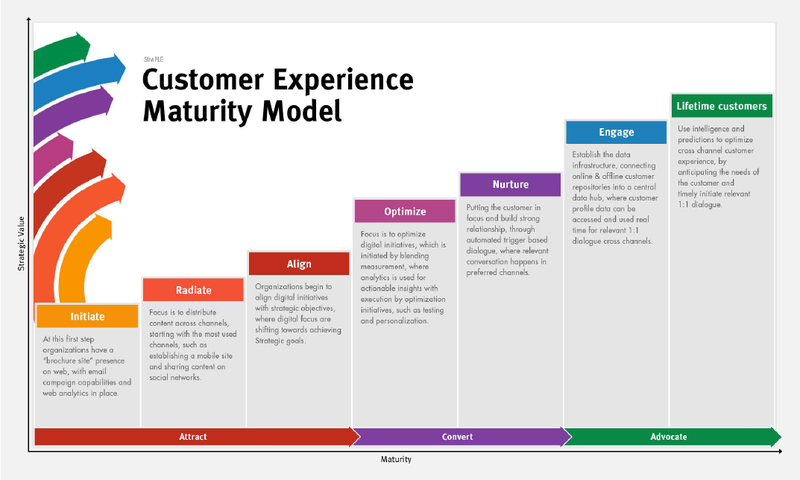 Sitecore, an Adobe AEM competitor, frames the maturity model slightly differently - 3 stages of maturity underpin 8 steps, each describing an increasingly more personal (and complex) environment. This is useful because it describes the environment for the customer and the business. There’s a value sweet spot and for many businesses that may fall a long way short of the things described on the the above diagrams, so why set a vision that’s inappropriate and begin a journey that’s harder work than it needs to be? Personalisation is complicated, often misunderstood and potentially very expensive. Getting the best from a personalisation project relies on solid foundations. An honest assessment of readiness (and the distance to travel). A proper design process in place. Aligns to goals, objectives and strategic themes. Can be built around user needs and behaviours. Can join together online (and potentially offline) journeys in a way that’s mutually beneficial to business and users. It may not be easy to do the work upfront to make personalisation a success, but it could make all the difference in how your website and brand is perceived. We've all had those small moments of delight when we've experienced truly useful personalisation, and it can even persuade us that an organisation cares more about us than their competitors.